WaveBPS can capture data in real time from a Picoscope USB oscilloscope (Figure 2). WaveBPS includes 3 capture modes including single capture, multiple capture, and a filter based multi capture. The filter based capture can be used to capture events based on the decoded information. 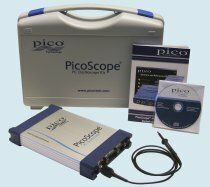 If you have the correct oscilliscope series selected WaveBPS will automatically connect to the PicoScope when it starts. After the PicoScope is configured you can click start on the capture toolbar (figure 1). The capture toolbar also lets you select the capture mode and displays capture and decode progress. INSERT LIVE CAPTURE MODES TABLE HERE! You can start the capture and select the capture mode from the capture toolbar. WaveBPS is a fully capable oscilloscope application allowing you to capture regular analog signals along with serial data. Therefore, WaveBPS has the same settings you are accustomed to on a traditional oscilloscope. You can customize your capture in many ways (figure 3). First, you can select how many channels you wish to acquire (Part B). Next, for each channel you can specify the probe type, voltage range and electrical coupling (Part C). For serial data, recommended settings are 10x probes, +/-20 V or lower range depending on the protocol, and DC coupling. Next you can set up the capture rate and length (Part D). First you pick how many samples you want to capture. Depending on the PicoScope, you can capture up to 128 mega samples. 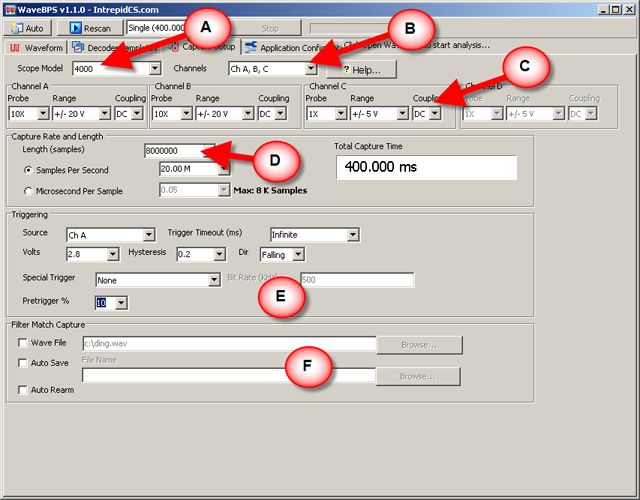 Next you can pick your sample rate as either samples per second or microseconds per sample. When you change your sample rate or sample length the total capture time display will update with how long your capture will last. Trigger setup is next (Part E). The Oscilloscope uses the trigger specification to determine when to capture data. Here you can pick the source (Channel A, Channel B, Channel C, Channel D, or External). You can also specify a timeout - this is how long WaveBPS waits for a trigger before auto triggering. For the trigger channel you can specify the signal transition that must occur according to voltage, transition direction and hysteresis. WaveBPS supports a CAN error frame trigger on selected oscilliscopes (pulse width advanded trigger). The error frame must occur on the trigger channel you selected. For this the trigger must be above the threshold for the proper number of bit times to qualify as an error frame. To enable this choose the CAN error frame special trigger and enter the bit rate of the CAN bus. The trigger supports pre-trigger data. This means you can capture a percentage of your buffer before the actual trigger condition. This is set in percent of your total capture length. For the filter match capture mode there are additional options (Part E). First, when a filter match occurs after a decode WaveBPS can play a wave audio file. Next, WaveBPS can also automatically save the file. Finally, WaveBPS can also automatically restart the filter match capture to look for the next event. There are many options to customize your analog capture.